The Brownells 308 AR Barrel Extension Torque Tool has a very misleading name. In fact my first impression after reading the title lead me to believe the 308 AR Barrel Extension Torque Tool was for tightening the barrel extension to the barrel. THAT IS NOT THE CASE. 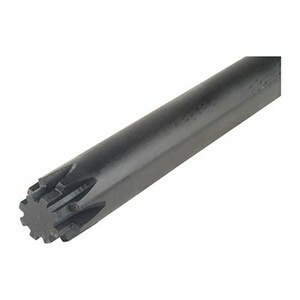 This tool is for preventing damage to your upper receiver when tightening the barrel nut. Description: Handy tool aids in applying straight-line torque for fast, easy installation of the barrel nut without scratching the exterior of the upper receiver. Helps ensure the right amount of torque is evenly applied, while maintaining proper alignment of the barrel, upper receiver, and gas tube ports. Use with any barrel nut wrench or free-float tube wrench and a torque wrench with a ½” square drive. Simply clamp the barrel nut wrench handle firmly in a bench vise, insert the barrel into the upper receiver, and finger tighten the barrel nut. Slide the barrel through the wrench, insert the Torque Tool in the back of the receiver until the teeth lock into the locking lugs in the barrel extension, and apply torque with the torque drive through the Tool to tighten the barrel nut. Precision machined from heavy-duty steel bar stock for years of reliable service. Available for the 308AR.